Scientists used ground-breaking techniques to reveal that small ruminant morbillivirus can adapt to infect human cells. Researchers at The Pirbright Institute have used ground-breaking techniques to reveal that the small ruminant morbillivirus can adapt to infect human cells. 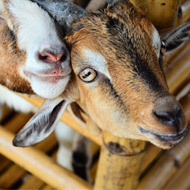 The study, published in the Journal of Virology, found that small ruminant morbillivirus (also known as Peste des petits ruminants (PPR)) could, through minor changes in a particular protein, overcome barriers that prevent it from entering human cells. Researchers say the findings have important implications for monitoring virus evolution in the field, particularly during eradication campaigns. Equally important, however, were the techniques used to identify the changes. Scientists say the method eliminated the need for live infectious virus and high containment laboratories, and meant modified live virus with potential zoonotic capability were not generated. Dr Dalan Bailey who led the research explains: “By examining the zoonotic potential of non-human morbilliviruses we identified that PPRV cannot enter human cells because it does not have the correct attachment protein configuration to bind to the human SLAMF1 immune cell receptor. He added: “It is important to note that this does not mean the virus would have the potential to cause disease in humans as there are many other factors required for the virus to successfully replicate and cause clinical symptoms, but it does indicate that these viruses have zoonotic potential given the right mutations and conditions. The study was carried out in collaboration with the University of Glasgow, the University of Cambridge and other institutions.